Professor Barbara Casu Lukac, Dr Fransesc Rodriguez-Tous and Dr Angello Gallo (CASS), and Professor Christoph Bruecker (MCSE) have won the 2018 President's Award for Outstanding Research Engagement - Media and Outreach. Four academics, three from Cass Business School and one from the School of Mathematics, Computer Science & Engineering, have won the 2018 President's Award for Outstanding Research Engagement - Media and Outreach. 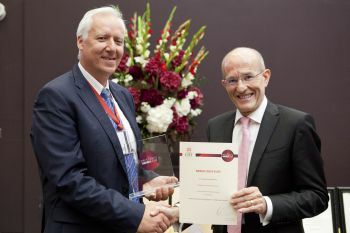 The award, introduced for the first time in 2017, is one of several categories in the annual President's Awards, which rewards the hard work and outstanding service of academic and professional staff at City, University of London, and which took place on 1st June. 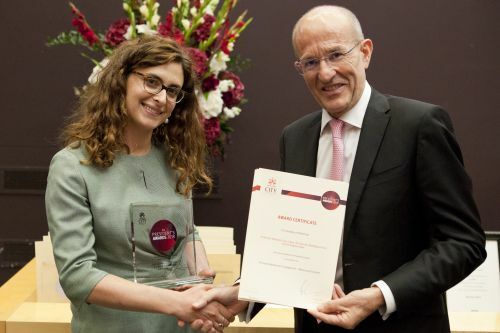 The first winner of the award was the Cass Business School team, comprising Professor of Banking and Finance, Professor Barbara Casu Lukac, Lecturer in Banking, Dr Francesc Rodriguez-Tous and Research Fellow, Dr Angela Gallo. Their research found that establishing a state-owned UK Post Bank would ensure the long-term sustainability of the Post Office by diversifying its portfolio of activities and increasing revenues. Their work received widespread media coverage and made waves in Westminster, being cited by a number of MPs and parliamentary advisors. The second winner was Research Chair in Nature-Inspired Sensing and Flow Control for Sustainable Transport and BAE Systems' Sir Richard Olver Chair in Aeronautical Engineering, Professor Christoph Bruecker. His research into the flight patterns and performance of the peregrine falcon featured in the BBC Two documentary ‘Super Fast Falcon’, significantly raising the profile of City's aeronautical engineering research. It was judged as a splendid example of the way fascinating STEM themes around nature and aviation can be blended and brought to the attention of the general public.